The radar station was constructed in 1941 as part of the Coastal Defence/Chain Home Low early warning system. It was designated site M47 and the original radar was mounted on top of the semi-circular transmitter and receiving hut as shown in the illustration. The site was later upgraded to be part of the Chain Home Extra Low system and was redesignated K47, with a new Transmitter and Receiving block. There are two smaller buildings, one of which housed a generator and the other a fuel store. At the other end of the field near the old railway, the bases of several accommodation blocks can be see, but none of the structure remains. This brickworks was setup in 1900 to provide bricks for the nearby Ravenscar development that never materialised, it is located inside an old Alum quarry. The remains of the single large Hoffman Kiln are still to be found on the site. 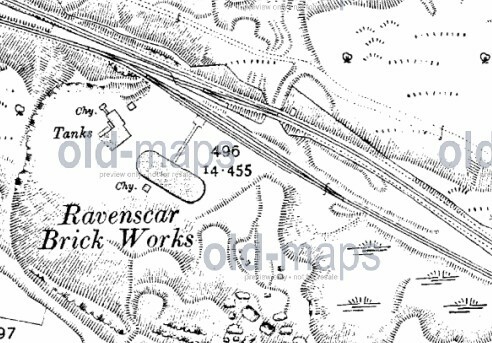 Despite the failure of Ravenscar, the brickworks was next to the railway and found work supplying bricks to Scarbrorough until the 1930s. The chinmeys on the site remained in place until demolition in the 1960s. The tunnel was cut so W.H. Hammond, the lord of Raven Hall, didn’t have to see the railway actually crossing his land. The tunnel is only 279 yards long but has a sharp curve and with the gradient up to Ravenscar being 1-in-39 it proved troublesome for many trains.